The 2013 Cadillac SRX luxury sport utility vehicle offers home system quality entertainment for the rear passengers. 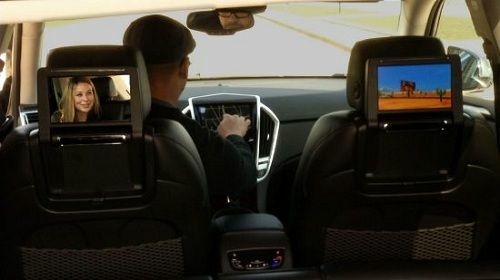 The 2013 Cadillac SRX will feature new technology to elevate the level of entertainment quality enjoyed by the rear seat passengers. Like many minivans and luxury sport utility vehicles, the 2013 SRX can come equipped with dual rear-facing monitors in the front seat headrests. The 8” screens flip up and are stored away when not in use by rear seat passengers. What makes the 2013 Cadillac SRX unusual is the level of integration available to those screens. Not only can users connect to a Blu-Ray video device, which is in itself cutting edge technology, but the screens can show a wide variety of media using Bluetooth wireless communication. For example, a camera SD car can be read and that will allow photos to be viewed. Of course all manner of smart phones’ music and video content can be streamed as well. Games can be played using this media streaming and the hand-held controllers will be very familiar in the little hands using them. Cadillac tested its system with kids. Knowing that the rear-seat electronic nanny can only be effective if the kids are not trading blows in an argument over what to watch, the screens are independent. One can be used to play a videogame and the other to view a movie, just as an example. Each system has its own wireless headset. Front passengers can use the CUE system’s 8 inch monitor to view movies and other media and should the family all agree on one thing at a time, the SRX’ speakers and audio can play the audio portion. Convincing the kids to join mom and dad on a leaf-peeping trip this fall has never been easier thanks to the SRX’ new level of entertainment available to rear passengers.